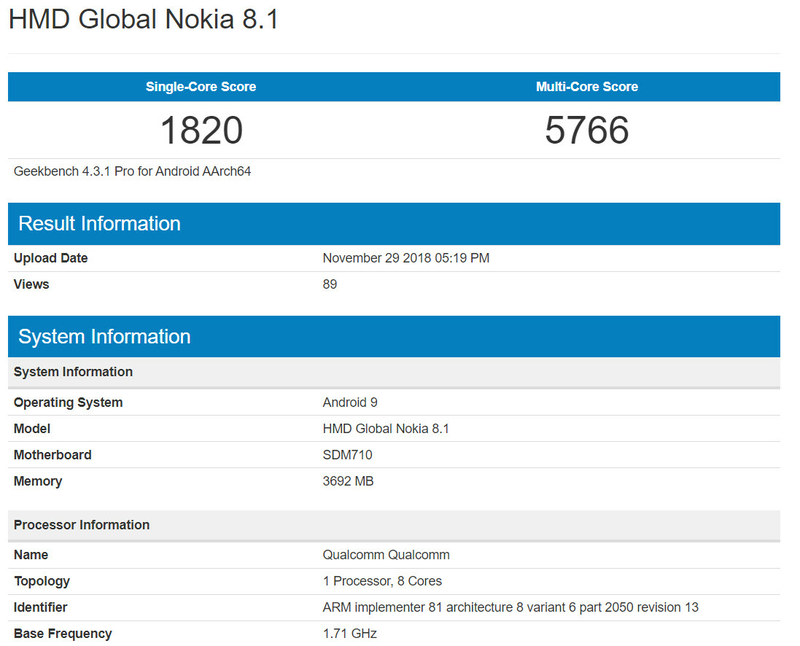 If all goes to plan, by next Wednesday the Nokia 8.1’s release status will have changed from “upcoming” to “announced.” And with just a few days ago, the device has made a quick appearance on Geekbench. Powered by Qualcomm’s Snapdragon 710, the Nokia 8.1 scored a respectable 1820 points on the single-core test. This then increased to 5766 points when all cores worked together. Now, according to a recent leak, HMD Global will be offering a variant of the device with 6GB of RAM and 128GB of storage. But from the look of this benchmark, a slightly cheaper model with 4GB of RAM is set to be sold – it will likely be accompanied 64GB of internal storage. In addition to this very respectable hardware, the Nokia 8.1 is also set to come pre-installed with stock Android 9 Pie straight out of the box as part of the Android One program. Also to be expected on the spec sheet is a 3,500mAh battery and a 6.18-inch notched display. As mentioned above, the Nokia 8.1 is currently expected to go official on December 5. While pricing still remains unclear, sales are expected to begin by mid-December in the hope of capturing some of the last-minute Christmas purchases. correct me if I'm wrong but is this phone performing worse than last years Nokia 8 ? Nope you are not. In general Nokia recent offerings have been confusing af. The 7.1 has a weaker chip than the 7 plus and so on. In general Nokia’s naming scheme is so confusing and they announce way too many phones yearly. See my comment #3 about the performance and changes in the smartphone series of HMD. I don't find the naming scheme confusing either, if you look at it for what it actually is. The 7.1 comes after the 7, not the 7 Plus, that's why you see the lesser chipset in the 7.1. I agree. Their naming scheme is utterly ridiculous despite what some people think. This is supposed to be a successor to the 7 Plus yet they stupidly name it the 8.1. How are you going to complain about people taking potshots when you are doing it here yourself? This is the successor to the 7, not the 7 Plus. You need to learn the facts before commeting. This just proves my point about the names. Lol you practically hand delivered me the point that proves you wrong. Lol, clearly it doesn’t, as continued positive sales and growth prove what you’re saying to be full of conjecture and a fallacy. That was a canned response. My point still stands in regards to the names. What I said was a factual response, and you cannot disapprove it. The names do not and have not negatively impacted sales or market share of Nokia branded smartphones. Therefore, you’re complaining for the sake of complaining. The 7.1 is the successor to the 7. Nokia needs to learn how to differentiate their own products and you need to learn what the difference between a fact and an opinion is because you seem to have both mixed up. As you can see, I made the correction in my comment #9 as this site wouldn’t let me edit my post in time. And you need to learn what a fact is and how to research them because you clearly don’t know what one is. You still think Nokia makes these phones, and it’s actually HMD that makes them. No, you just didn't know what you were talking about. That's what you get for trying to rush your response out just to say something that goes against what I said. I do my homework. Me posting what I did actually proves that I do know what I’m talking about. You can’t logically dispute it, so you want to run with your usual smoke and mirrors. This is what happens when you clearly don’t do your homework, as you obviously do not. No, you really don't know what you are talking about otherwise you wouldn't have to try and correct yourself lol. I'm not the one who runs with smoke and mirrors like you do with your OEMs. Lol, I clearly do, but it’s obvious that you don’t, that’s why you said that HMD updated one of their smartphones in November for the October security patch, and that was clearly false. You’re full of smoke and mirrors. It was mentioned a little while back that HMD has change its 8 series Nokia phones to midrange, and it now uses an upper midrange chip. That's why you see the drop off in performance. There was even an article on PA about it. 9 series will be HMD's high end. 7 series is now in the middle of the midrange pack, 6 series is low midrange, and below that is low end. Not really confusing once you take the time to read up on it. And that's why Nokia needs to do a better job of naming their products. Just because you’re incapable of reading what this actually about doesn’t mean HMD (not Nokia, they don’t make phones anymore) needs to do a better a job. They did the job. You just refuse to accept it. If multiple people, including several PA authors, are questioning the naming scheme of their products, then yeah they do have a problem. Plain and simple. What “multiple people”? Where? Here? Are they actual consumers of HMD products? Did they accidentally purchase a Nokia branded smartphone thinking it was a different one because they were confused by the name? Have you actually heard of ACTUAL HMD Nokia branded smartphone buyers complaining about this very thing online? Do you have any link at all saying something like this} And did you forget that it was a PA author that responded to a comment on an HMD article that you commented on saying that it this makes sense? If the sales and market share growth haven’t been negatively affected by what you keep complaining about in any way, then it’s all just complaining for the sake of needing something to complain about, plain and simple. You are really grasping at straws now. You have a tendency to turn a blind eye to the truth and to any thing that proves you wrong. Remember when I posted proof that your other OEM were becoming patent sharks? In other words, you CAN’T prove anything that I’ve asked you to, so you’re deflecting from the topics altogether, lol. And now you’re further deflecting by bringing up another OEM that you couldn’t provide proof from a court of law about being a patent shark. Classic mxyzptlk behavior when you can’t provide proof about anything. 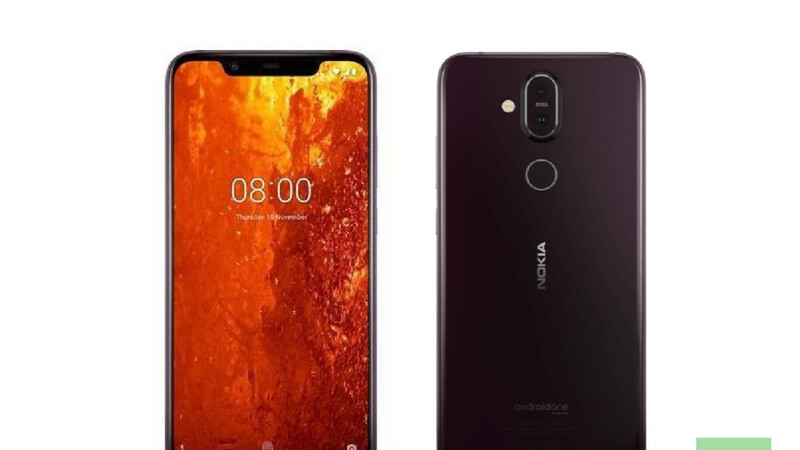 Seems like Nokia needs a better solution in their marketing department because they are doing a poor job of making the names less confusing. HMD's continued growth in market share and sales proves that the actual consumers of HMD products aren't having an issue when determining which Nokia branded smartphone they wish to purchase, proving your statement to be full of conjecture. Only because you give them a free pass and refuse to acknowledge the fact that the names don't do a good job of differentiating their different products. Don’t be ridiculous. The fact that their sales and market share are in the positive and growing has absolutely nothing to do with anyone giving HMD as pass. You just want to complain about something you don’t like for the sake of complaining. I'm not complaining at all, and I never said anything about not liking Nokia phones. Stop making stuff up to fit your obviously false narrative. You are complaining, and you’ve been doing it for just about every HMD article that gets posted, including this one. It’s all here in digital ink for all to see, so its you that’s actually making stuff up to fit YOUR obviously false narrative. I'm not complaining. Once again it's just you and your ridiculous false narrative. Stop making stuff up.